Researchers at the University of Southampton, in collaboration with colleagues at the University of Cambridge, have developed a technique to help treat fatal diseases more effectively. 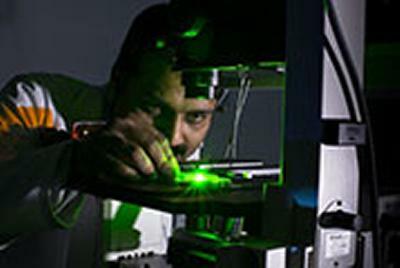 Dr Sumeet Mahajan and his group at the Institute for Life Sciences at Southampton are using gold nanoprobes to identify different types of cells, so that they can use the right ones in stem cell therapies. Stem cell therapy is in its infancy, but has the potential to change the way we treat cancer and other life-threatening diseases, by replacing damaged or diseased cells with healthy ones. One of the key limitations of stem cell therapy is identifying the right cells to use for different therapies. This fundamental problem with the treatment is being tackled by this new research. The team who discovered SERS in the 1970s found that by roughening a metal surface upon which they had placed molecules to be examined, they could increase the signal by which they could detect these molecules, by a million times. This allowed them to detect molecules in far smaller quantities than ever before. SERS has been used in many different capacities around the world and across industries, but this new research marks the first time it has been used in the field of cell therapeutics. Dr Mahajan’s research could mean that stem cell and other cell-based therapies could be advanced much further than the current most common uses, such as bone marrow transplants. The results of Dr Mahajan’s work, funded by the Engineering and Physical Sciences Research Council (EPSRC), have been published in the influential journal Nano Letters. He is collaborating with major pharmaceutical companies to further develop more effective drugs using this technique.